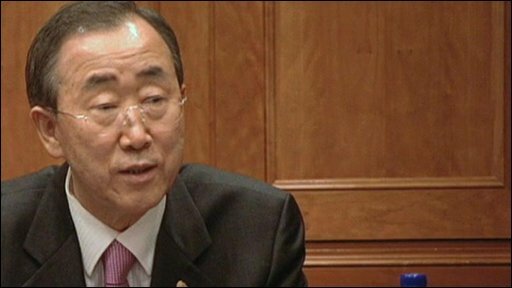 UN Secretary General Ban Ki-moon has called on Burma's military junta to release opposition leader Aung San Suu Kyi and all other political prisoners. Mr Ban made the request during talks with Gen Than Shwe in the remote administrative capital Nay Pyi Taw. He also asked to be able to visit Ms Suu Kyi in jail in person, but said he had not yet been given permission. Ms Suu Kyi, a Nobel Peace laureate, has spent much of the past two decades in prison or under house arrest. Her trial, on charges of breaking the terms of her house arrest, has been adjourned for another week. Mr Ban said he had had "a very frank and extensive exchange of views on all the matters of the spectrum of issues pertaining to Myanmar [Burma]," during nearly two hours of talks with Gen Than Shwe, the country's top military leader. Mr Ban said he had been assured that elections planned for 2010 would be "held in a fair, free and transparent manner". "I proposed and I urged that all political prisoners should be released before this election begins, so that this election can be all inclusive," the AFP news agency quoted him as saying. Burma's political prisoners are thought to number about 2,100. Mr Ban said he had also asked Gen Than Shwe whether he could see Ms Suu Kyi in person before he left Burma. "He told me that she is on trial but I told him this is my proposal, this is important and I am waiting for their consideration and reply," said Mr Ban. When asked when he was expecting an answer from the junta, Mr Ban replied: "I am leaving tomorrow, so logically speaking I am waiting for a reply before my departure." If Mr Ban is eventually allowed to meet Ms Suu Kyi, he would be the first UN secretary general to do so. The trial of 64-year-old Ms Suu Kyi has caused outrage around the world. Critics of Burma's military government have dismissed it as a ruse to keep the opposition leader locked up until after next year's election. Ms Suu Kyi's lawyers have been appealing against the judge's ban on testimony from three defence witnesses. One additional defence witness will be allowed to testify. "The Supreme Court did not send the case files to the lower court, so the case has been adjourned until July 10," said her lawyer, Nyan Win. He added Ms Suu Kyi had expressed surprise at the further delay. The BBC's Laura Trevelyan, in Nay Pyi Taw, says Mr Ban is thought to believe he has a rapport with Gen Than Shwe. But the UN always knew this would be a risky trip, and so far Mr Ban has not managed to gain any concessions from Burma's ruling generals, says our correspondent. 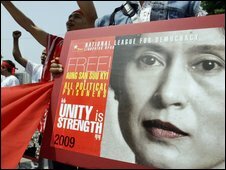 Why is junta afraid of Suu Kyi? In his opening statement to the junta leader, Mr Ban had said he appreciated the general's "commitment to move the country forward". "I would like to contribute, to work together, for peace and prosperity," he said. The government called national polls in May 1990 which Ms Suu Kyi's National League for Democracy (NLD) won convincingly, but the junta refused to hand over control, and has remained in power ever since. The BBC's Jonathan Head says the failure of many previous UN missions to Burma has at least lowered expectations of this one. But Mr Ban needs to come away with something more than a few token prisoner releases if he is to avoid charges that his visit is merely being used by Burma's military rulers to boost their legitimacy, our correspondent says. This is Mr Ban's first visit to Burma since he persuaded the junta in May 2008 to accept international aid in the wake of Cyclone Nargis, which killed nearly 140,000 people. Critics say there is little sign that the UN has wrung any other concessions from the regime. But some analysts speculate that Mr Ban may have been given an indication by the generals that the visit could harbour some kind of positive result. Ms Suu Kyi was transferred from house arrest to prison in May after an American man swam to her lakeside house. She faces up to five years in jail if convicted. Human Rights Watch said Mr Ban should not accept the return of Ms Suu Kyi to house arrest as a sign of a successful visit. "Time and again, the UN has politely requested Aung San Suu Kyi's release, but her 'release' back to house arrest would be a huge failure," said executive director Kenneth Roth. The NLD leader led a revolt against Burmese dictator Gen Ne Win in 1988, calling for peaceful democratic reform and free elections. But her movement was brutally suppressed by the army, which seized power in a coup on 18 September 1988.